New York--Swann Galleries will offer a sale of Vintage Posters on Thursday, February 7. The auction comes packed with memorable Art Nouveau images and rare advertisements, alongside seasonal ski and winter resort posters. Ski and winter posters are well represented with Walther Koch’s 1908 Art Deco inspired poster for the World Allround Speed Skating Championships in Davos, Switzerland (Estimate: $4,000-6,000). The German version of Emil Cardinaux’s advertisement for skiing in Switzerland from 1919 depicts a snowy scene of skiers as they overlook the Aletsch Glacier ($3,000-4,000). Advertisements for North American winter destinations include Roger Couillard’s Visit Canada / Travel Canadian Pacific, circa 1955, ($1,000-1,500), and Willian Willmarth’s Sun Valley Idaho / Summer Holiday, 1939 ($2,000-3,000). Also available are posters advertising travel to popular destinations of the time such as Vichy, 1911, by Louis Tauzin ($3,000-4,000) and Southport, circa 1935 by Fortunino Matania ($5,000-7,500); additionally, images promoting travel by ocean liner, rail and plane form a robust section of the sale. Among the rarities offered in the sale a 1927 poster for the Stockholm premiere of Josephine Baker’s silent film La Sirène des Tropiques stands out. The image is rendered after a photograph taken by Lucien Walery which had appeared in a program for the Folies Bergère and depicts the star in her recognizable “pearl and feather” costume. The poster comes across the block estimated at $12,000 to $18,000. Italian and French poster designer Leonetto Cappiello is present with a run of lots including “Borea” / Calze per Uomo, 1923, an amusing poster for men’s socks, and Lait Gallia, 1931, a first at auction for the image, each estimated at $4,000 to $6,000, and Contratto, 1922, which is expected to bring $3,000 $4,000. The sale is led by Les Maîtres de L’Affiche, a breathtaking group of five complete volumes-a total of 256 plates-of reproductions of the most notable posters from Europe and America as selected by the famed critic Roger Marx. 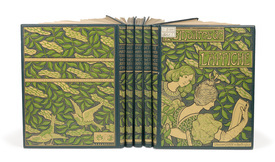 Published from 1896-1900, each plate is a full-color lithograph bound in special bindings by Paul Berthon and carries an estimate of $40,000 to $60,000. Additional portfolios include a rare standout work by Alphonse Mucha, Documents Décoratifs, 1902, complete with 72 plates displaying examples of jewelry, furniture and silverware, as well as illustrating how to draw women and flowers each demonstrating Mucha’s stylistic expertise ($15,000-20,000), and L’Estampe Moderne, 1897-99, a complete volume of 100 plates designed by favorite artists of the day ($15,000-20,000). Works by Mucha stand out in of a run of ethereal Art Nouveau images. Highlights include two offerings of the artist’s allegorical rendering of The Seasons, both from 1896 ($8,000-12,000 and $20,000-30,000, respectively), and the artist’s advertisements for Job cigarettes are present with versions from 1896 and 1898 ($10,000-15,000 and $6,000-9,000, respectively). The Italian poster, Biscottini E. Amaretti Desler, circa 1900, by Osvaldo Ballerio, makes its auction debut at $4,000 to $6,000. [La Vitrioleuse], 1894, by Eugène Grasset is the artist’s most accomplished example of Japonisme. Initially printed for L’Estampe Originale, the lithograph depicts an unusual subject matter for Art Nouveau: woman filled with vitriol holding a cup of poison, however, the work remains an outstanding example of the genre ($2,000-3,000). A selection of political and wartime advertisements, as well as artist and exhibition posters with the likes of Jean Cocteau, Miró and Picasso, and Pop artists Robert Indiana and Roy Lichtenstein will round out the sale. Exhibition opening in New York City February 2. The complete catalogue and bidding information is available at www.swanngalleries.com. Image: Lot 291: Les Maîtres L’Affiche, various artists, group of five complete volumes, 1896-1900. Estimate $40,000 to $60,000.